A saint poet of 13th century, Gyandev, had created an interesting children’s game called Moksha Patam. The square board game contained a lot of snakes and a lot of ladders. That is why, under British occupation, the British later named it “Snakes and Ladders” instead of the original Moksha Patam. 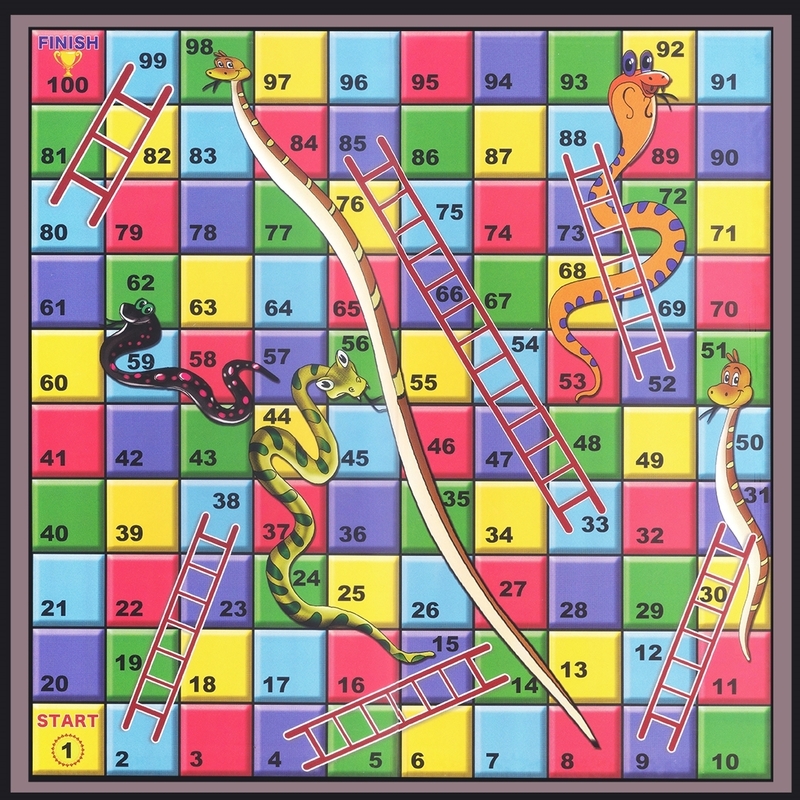 Snake and Ladders game is very popular among children and parents are also happy to play the game because it develops counting abilities, the pattern of numbers, fine motor skills, and teamwork. 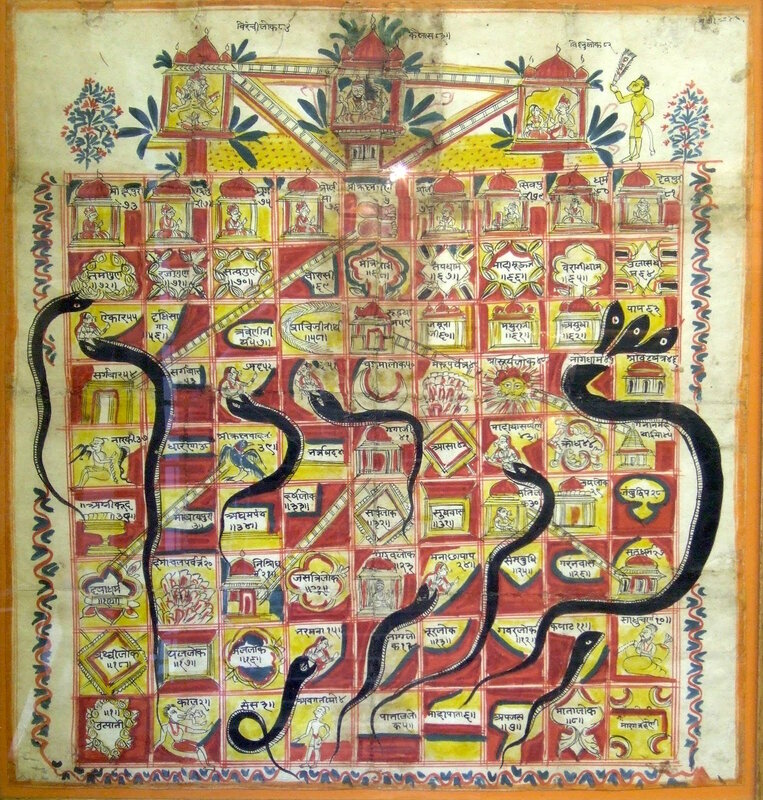 A typical snakes and ladder board is like this. It doesn’t usually have writing on it. But, the original board game had written words at the start and the end of each snake and ladder. There were five ladders starting at the following squares. These were the squares from where one could move ahead faster by skipping intermediate ladders. The tops of each of the ladder depict a God, or one of the various heavens like Kailasa, Vaikuntha, Brahmaloka and so on. The snakes in these squares are waiting with its mouth open to swallow and undo the progress made so far. The length of the snake represented the severity of the action. The 100th square represented the ultimate state – the Nirvana or Moksha. As the game progressed various actions of a person were supposed to take you up or down the board like that in the real life. Some believe it was also called “Gyan Chaupar”. Unlike the modern version played solely for fun, the game was originally created to impart the knowledge of basic ethics and the concept of Hinduism. The game was was envisioned as sort of spiritual journey of a person starting from the square 1 known as Utapatti / birthplace, and gradually moving. The following versions are 9×9 board games with 81 squares. 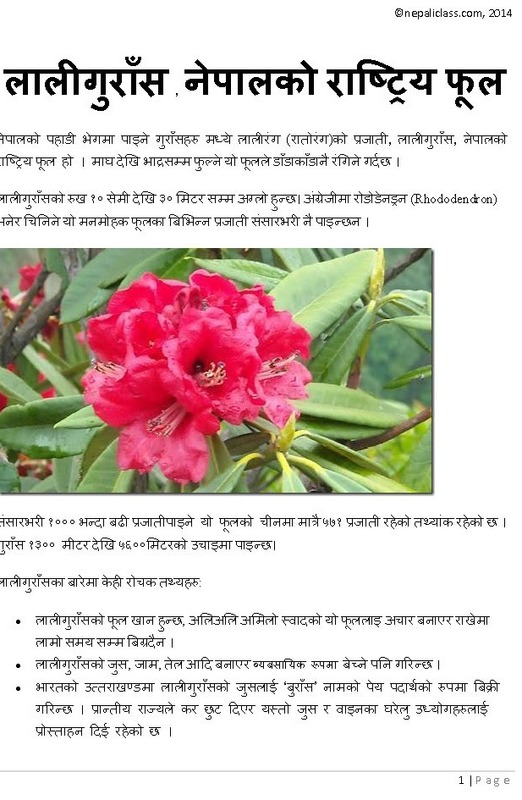 What is the Meaning of the Flag of Nepal?